I am not a registered nutritionist, nor am I a highly trained chef. I have a few recipes (mostly basic items) in my repertoire, that I tend to repeat over and over — much to my family’s dismay. The first time I ever cooked dinner for my husband — whole wheat pasta with fresh spinach, tomatoes, basil, and garlic sautéed in olive oil — he looked at me like I was crazy and asked, “where’s the meat?” It’s safe to safe he and my toddlers share a similar palette when it comes to food. Married for almost five years now, I’ve developed some less than ideal eating habits. Pizza, hamburgers, and chicken nuggets are staples in the Tomes household. We also eat a lot of French fries. See #itoldyou. Then I found out I was pregnant with baby number three. I’ve written before about my bad (eating) habits during pregnancies number one and two. Thankfully I never developed gestational diabetes, or had any other health-related complications with these pregnancies, but I did manage to gain almost fifty pounds (both times). Yikes! I really packed it on (all over). I was unnecessarily huge because I literally ate everything I could get my hands on — especially cupcakes and ice cream (my greatest weaknesses). I love getting (and receiving) sweet treats for baby! I also love chocolate. It’s kind of a problem. It took me forever to lose the baby weight. Even with breastfeeding, which we all know burns some major calories, it didn’t help me lose all the lbs. With this pregnancy, I knew I didn’t want to go through that again. I wanted to eat right and to have a healthier pregnancy this final go-round. But I didn’t know how (or where) to get started. And then I found Pregnancy Bites — the solution that I was looking for and the answer to every wannabe-healthy (but insanely busy) pregnant mama’s dreams. This is exactly what I need — something to take the guess work out of my diet. The Pregnancy Bites website is so simple and easy to use! I don’t know about you guys, but for me this is basically a miracle of epic, divine proportions. I am BUSY. And I am EXHAUSTED. (I’m sure you all can relate.) The last thing I feel like doing at the end of the day is slaving over a hot stove and cooking my family dinner — luckily my husband usually handles this. And don’t EVEN get me started on #mealplanning. (Who seriously has time for this? People without kids, that’s who. And liars. haha!) If it’s easy and accessible, it’s probably going in our mouths. And that doesn’t always make for the most nutritious meals. I realize this. The Weekly Meal Plans include such a wide variety of healthy (and family-friendly) recipes. And I (sometimes) feel really guilty about it. Especially because I am growing a tiny human in my belly. 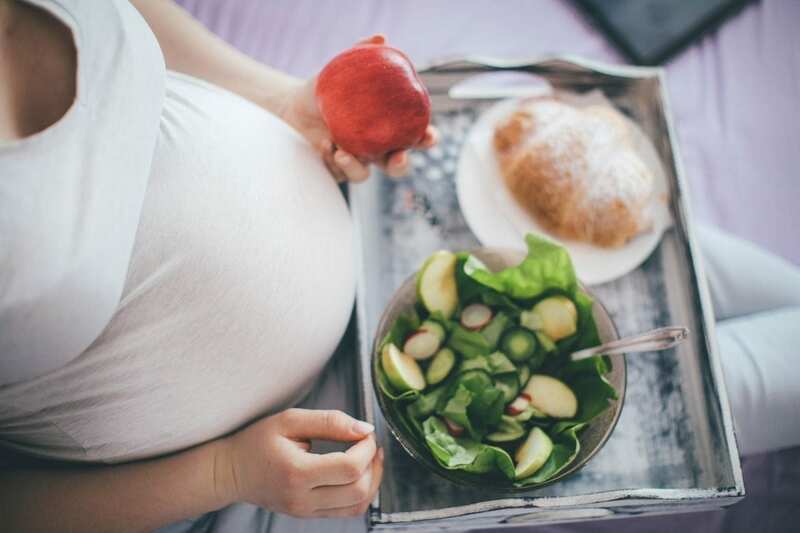 I love that Pregnancy Bites does away with all the guessing: Guessing about how much I should eat and when, and guessing about what foods I really should be eating more of, and which foods I should be avoiding. The recipes are also extremely simple, and easy to follow. Even for a beginner like me. And they are DELICIOUS. Even your kiddos and husband will enjoy them. Trust me here — I’ve got some tough critics living under my roof. We don’t do well with fussy foods in the Tomes household. Amy and Sonnet really have this whole “eating for two” thing down pat. They are experts. Most of us (in the general population) are not and I’m going to trust them. I recommend that you check it out and trust them too. Planning to give Pregnancy Bites a try? You have to let us know what you think! Don’t just take our word for it. This is such an important time in your (and your baby’s) life. Why not give him (or her) the absolute best start possible?